So much to know, so much misinformation, so little time! What is a cavy slave to do? The BEST place for care basics, a great introduction for beginners, is Guinea Lynx's Guide to Raising a Healthy Guinea Pig. Then when you have more specific questions, the Guinea Lynx site is one of the best online references for care and medical information. Please see GuineaPigs.INFO for additional websites and forums which contain good information about guinea pigs. Guinea pigs are strict herbivores. While this is not intended to be a care list, we would like to share some of the common mistakes, misconceptions, and lack of information people have about cavy care and cavy management. This is the most common problem we see at our rescue. Please see Guinea Pig Cages for lots of great cage info and proper size requirements. Wrong. It depends on the personalities of the guinea pigs. Many, many males live together in pairs or trios and are quite happy with no fights. Some sows will not get along and cannot be housed together. It all depends on the individual guinea pigs. Not giving guinea pigs unlimited Timothy Hay around the clock is a big mistake. Many people don't seem to know that guinea pigs NEED hay. Many people buy the hay they find at the pet store, the most commonly found packaged hay is Alfalfa hay. Many people buy Alfalfa hay because that is what the pet store people told them to buy. Alfalfa hay should only be given to pregnant mothers and growing babies. Alfalfa hay has too much calcium and other nutrients which can cause bladder stones in guinea pigs. 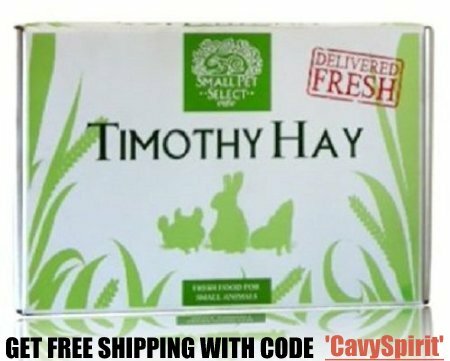 Timothy hay helps their digestive system and is the best way to help keep their molars ground down and healthy. Our favorite online hay vendor is Small Pet Select. Use coupon code 'CavySpirit' to get FREE SHIPPING for the best hay available at Small Pet Select. This is a common problem. Guinea pig nails need to be trimmed about once every 4-6 weeks. They can curl and grow back into the pad causing pain and infections. It's very easy to do on your own. See this Guinea Lynx page for more info. DO NOT USE the vitamin drops in the water! The only supplement a healthy cavy needs is Vitamin C. The vitamin drops that you buy at the pet store contain additional vitamins and minerals which can potentially be toxic to them. Vitamin C deteriorates rapidly in WATER and in LIGHT. Cavies drink varying amounts of water. There is no way to know how much Vitamin C your cavy is actually getting. Adult cavies need 30-50 mg per day of C. The drops make the water taste bad, thereby discouraging many cavies from drinking water---not good! Your healthy cavy shouldn't need additional Vitamin C supplements IF your cavy is getting proper fresh greens and some fruits and high quality, fresh guinea pig pellets on a daily basis. You should not give your cavy a diet high in fruits to ensure they get adequate vitamin C.
To supplement, get the chewable 'Vitamin C only' tablets for adults or children. To ensure proper dosage, divide up the tablet and then crush it, or crush it and then divide it up. If you have a 500 mg tablet, then one cavy needs 1/10 of that daily. It's best to divide it up into two doses, one in the morning, one in the evening. You can mix the powder or chunks in with their pellets or sprinkle it on their veggies. An easy way to crush a tablet is between two tablespoons. You can also dose the C directly, especially if you have a sick or needy cavy. Purchase some liquid vitamin C from a health food or drug store. We use a flavored GNC brand and the piggies like it. It says one teaspoon equals 5 ml and that is 500 mg of C. So we divide 500/5 and we get 100 mg in 1 ml. So, for a 50 mg dose (divided in 2--am and pm), we give .25 ml in the morning and .25 ml in the evening. Of course you need a little syringe to do this--also available at a drug store or vet. (1 ml = 1 cc) If you have a very sick or pregnant cavy, you can double the dose. Wrong. These are big health hazards to your guinea pig. They can cause spinal injuries and foot and ankle injuries leading to very difficult, life threatening problems. DO NOT USE these products. Guinea pigs like and need a variety of fresh vegetables and some fruits, just like we do. Make sure you focus on high-quality greens and veggies which are high in vitamin C and low in calcium. See this Guinea Lynx page for more info. #8 If I get two guinea pigs, they won't bond with me! Guinea pigs are a social, herd animal and normally do much better, and are healthier and happier in pairs or trios. They will still bond with you. By having two, you give them a happier life when you are not around. The cost and care of two is not much more than one. Do you have any idea how many people come to our rescue with stories of unknowingly buying sick guinea pigs from pet stores only to have them die a week later? Quite a few. You should ALWAYS check the shelters and rescues first. For information, please see either the Adopting or the Surrendering page on finding a guinea pig to adopt. These are important topics as they are frequent excuses and only occasionally legitimate reasons for needing to rehome your guinea pigs. Medical problems we have had: Our photos and explanations of some our piggie problems! Not just for grown-ups. Only black and white drawings, but packed with very good and correct information.